Joe Perry collapsed offstage and was rushed to hospital during a Hollywood Vampires show at the Ford Amphitheater in Coney Island, New York on Sunday. Page Six reports the 65-year-old Aerosmith guitarist was performing with the supergroup on their summer tour of North America when he stumbled offstage and, according to sources, soon lost consciousness and apparently went into cardiac arrest around 9:30 p.m, with police on the scene reviving him. A clip posted by Instagram user @leeniepics shows Perry wobbling offstage before being treated by emergency officials. Perry was taken to Coney Island hospital, where he was listed in stable condition. At around 10:00 p.m., Cooper stopped the concert and informed fans that Perry had not been feeling well. “If you notice one of our brothers is not onstage with us, he was very sick before the show,” Cooper reportedly told the crowd. The Hollywood Vampires are scheduled to perform on CBS-TV’s The Late Show with Stephen Colbert on Monday, July 11 and their next concert is scheduled for July 12 at the Fraze Pavilion in Kettering, OH. 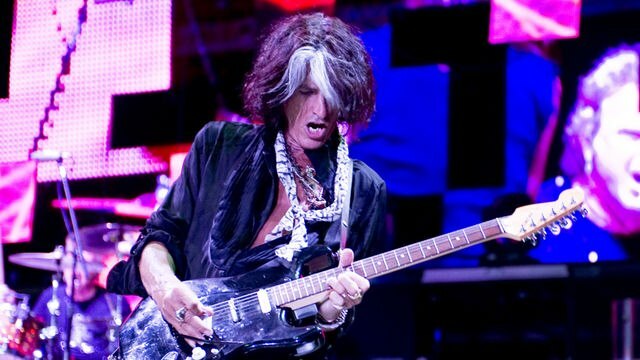 Joe Perry is stable and resting. His brother Vampires and fans wish him a speedy recovery.